Scribbled Slate: Have you tried Coke Zero yet? Have you tried Coke Zero yet? I am one of those guys who needs a constant supply of coke to keep going. I used to gulp down as many as 8-9 a day. I ABSOLUTELY love the taste !. But over time, all those calories and carbonated water started making me feel stomach heavy. I unsuccessfully tried switching to diet coke or diet pepsi to at least cut down on the calorie intake. Ho diet coke is horrible and diet pepsi I can do with, but not for long. So I found myself coming back to coke again and again. Something in it.. the taste .. may be the caffeine. With some restraint, I can now get away with 2 a day. Trident has really been helpful in this regard. I realized chewing Trident brings down my urge to grab myself a coke. So I find myself chewing Trident all day, spitting it out only to have lunch. One of these days I watched the sue-coke-zero-for-taste-infringement commercials. They are really funny. Given the diet coke experience, I wasn't really looking forward to a rich taste...but to my surprise it was real close to coke classic. Well, you can't make it taste exactly like coke classic when it has only zero calories. It was close enough that I decided to give it a chance. So I have been training myself to Coke Zero and am officially switching from Coke Classic to Coke Zero, AT LAST. Eventually, I would love to get away from the urge to drink coke anymore. 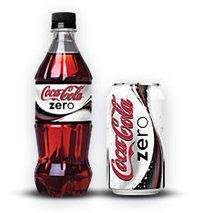 So If you are looking for Coke-ness without the calories, Coke Zero is worth a shot. Off to another Coke Zero and wilfing !